With the general election looming, the state of the NHS is one of the issues that will affect the outcome. So Michael Wynne’s verbatim play about doctors, nurses and hospital staff is certainly timely. It also has an epic feel, covering not only health workers but politicians, policymakers and historians from all around the country. 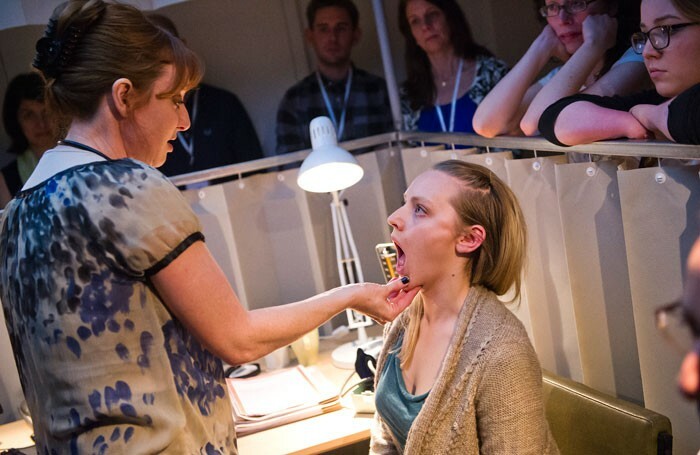 In part one, called Symptoms, the audience is split into three groups and taken on a tour of the theatre, up and down the back stairs and offices, where an assortment of consultants, nurses and other health workers explain the stresses affecting the NHS. Sympathetic characters, such as Louise the GP, alternate with more philosophical ones, such as a Voltaire-quoting cardiologist. Part two is called Diagnosis. Now the audience is seated and watch an inconclusive debate about recent health reforms, as well as hearing various ideas about how hard it is to improve the NHS. The case of the Mid-Staffordshire hospital scandal is explored. At its best, the show recounts some memorable anecdotes and introduces us to some appealing characters such as. Jonathon the GP (Philip Arditti), Marjorie the nurse (Eileen O’Brien) and campaigner Julie Bailey (Elizabeth Berrington). What the play fails to do is to create a strong central metaphor, a compelling narrative or an optimistic vision of the future. Three directors — Debbie Hannan, Lucy Morrison and Hamish Pirie — are needed to marshal the large cast who each plays multiple roles, supported by numerous extras. As in the NHS, everyone works hard, but the results are distinctly mixed.